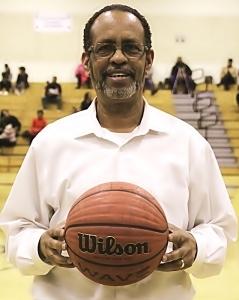 Stone Mountain’s Tony Stroud joined an elite club with his 300th victory this season. He is 302-250 over 22 seasons. Tony Stroud joined an elite club on November 13 as his Stone Mountain Pirates rolled past the McNair Mustangs 68-49 to give their coach his 300th career victory. Stroud entered the season with a 299-249 record in 22 seasons of coaching in DeKalb County at Southwest DeKalb (15 seasons) and Stone Mountain (7th season). Jacorrie Knowlton helped propel Stroud to his historic career victory with a 13-point, 13-rebound double-double against McNair while teammates Shawn Hazelton (14 points) and Bryson Dennis (10 points, 4 assists, 4 steals) helped ensure the victory. Stroud the son of legendary Georgia basketball coach Cleveland Stroud got his first head coaching job at Southwest DeKalb in 1996 and compiled a record of 229-166 over 15 seasons (1996-2010). Stroud won 22 or more games five seasons at Southwest DeKalb including a 22-8 mark in 1998 where his team advanced to the Class 5A state quarterfinals in one of seven state tournament appearances. After a two-year hiatus, Stroud took over the Stone Mountain program where his high-water mark was an 18-8 record in 2015 and a state tournament appearance with a 17-12 mark in 2014. His team is off to a 3-1 start this season with its only loss coming on Tuesday against the No. 4 ranked Cedar Grove Saints.